Time truly flies, it is the season for hairy crab once again! 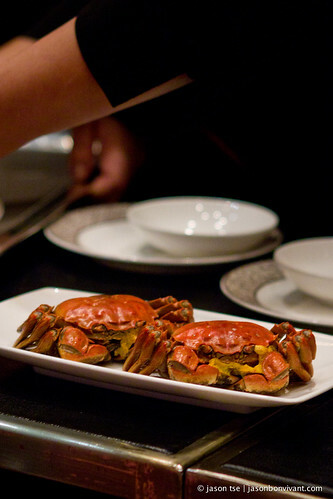 Instead of cooking myself this year, I kicked off the hairy crab fest at Man Wah (Mandarin Oriental). Truly an indulgence I may add. 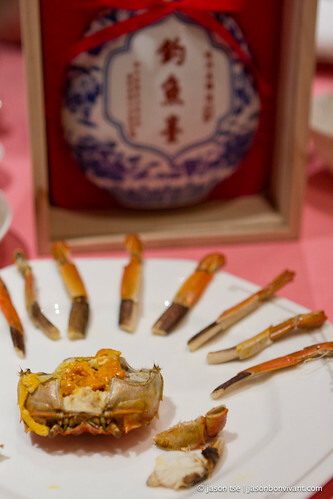 I was invited along with a few other fellow bloggers to attend the advance tasting for the special offering from 15 to 23 October during which the Crab Palace Restaurant in Shanghai will be visiting Man Wah, bringing a series of famous dishes including its famed Shanghai hairy crab. 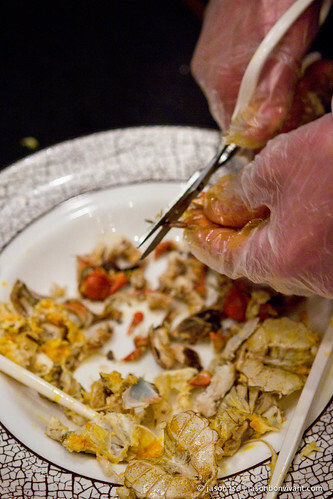 One of the special highlights will be the technical display of de-shelling crab in front of diners in three minutes! I do wonder how long it took them to master such a skill! 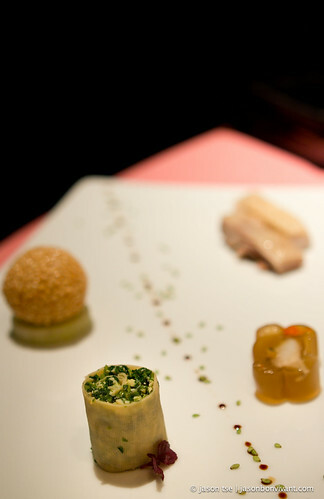 We started of with a selection of appetizer which included deep fried sesame ball with crabmeat, crab claw jelly, marinated chicken Shanghainese style and vegetable beancurd roll. I was quite impressed with the crab claw jelly not just because of its cuteness but the intensity of the flavor in such a small package. 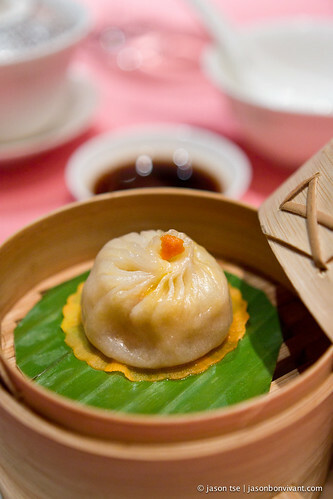 Next was the familiar crabmeat dumpling also as we often called XLB Xiao Long Bao. The skin was not as thin as expected but then again, there are many school of thoughts on what constitutes an authentic XLB. I say it all depends on your preference because I tried enough XLBs to admit that both styles have their own charms and following. I talked about the history of XLB before during my Shanghai trip last year and I think we should have an open mind as well when having XLB especially with regards to the thickness of the skins. 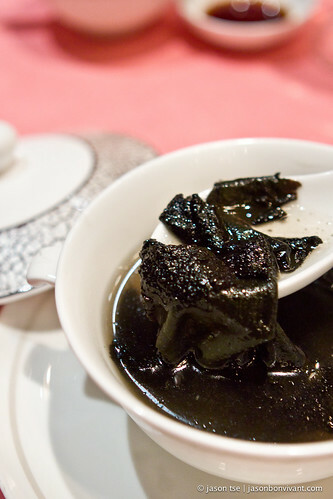 All I know about this Rock Fungi Soup was their the rock fungi is quite rare and hard to find. If you can read Chinese, you can refer to Smashing Pumpkin's explanation / information of Rock Fungi. It was time for the star of the show!!! 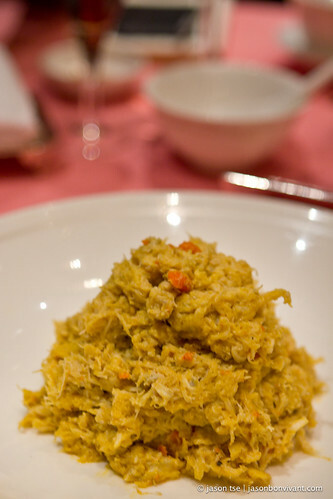 Shanghainese Crab! 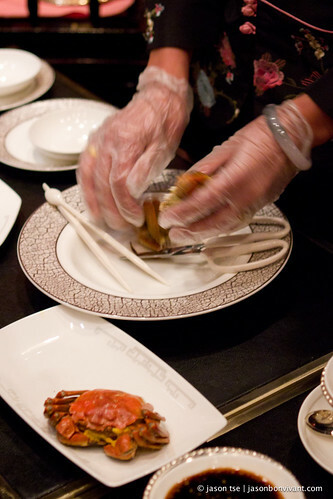 The skilled staff from Shanghai grabbed a single crab and stared to do the magic! I could not follow to be honest because she was fast at de-shelling it, and I am quite serious about it! What can I say, she is good at what she is doing. I do wonder how many crabs she usually de-shell in a day? haha. It was nice to have the crab de-shelled for you but to be honest, I do enjoy the de-shelling process myself although it would take me more than 3 minutes for sure! It was a good show nonetheless. 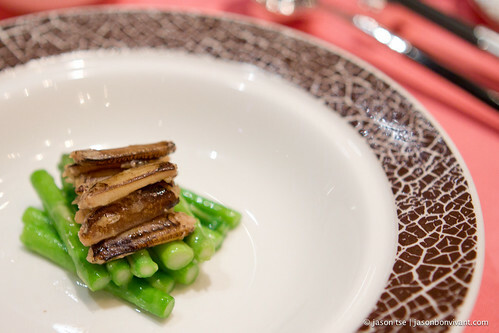 Fried Shanghaianese crab legs and asparagus was finely presented. What I almost missed was how they come with exactly the same number of fried crab legs and asparagus so you can eat them together on every bite. By the time this dish was served, I started to wonder how many crabs we have indulged so far? I think by that time we have used at least over 10 crabs! More to come! We often talk about the texture of Wagyu beef as melt in you mouth, but the signature Shanghainese stewed pork served next carried the same characteristics to my pleasant surprise. Stirfried crabmeat. What can I say, cooked with about 10 - 12 crabs, it was simple yet splendid! It will cost you HKD680 a dish but if you are in for a special indulgence, just order it and enjoy it with rice or noodles or by itself. Do not be surprised if you start to make noises with your eyes closed on your second or three spoonful! 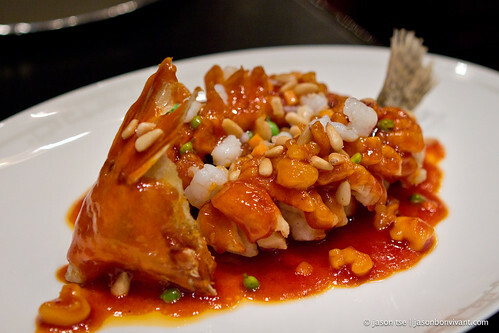 The sweet and sour fish, shrimp, pine nuts was a bit of a disappointment because it was slightly on the dry side in my opinion. While beyond decent, I am going to skip talking about the Dan Dan noodles with crabmeat because something else took over the highlight of the night! 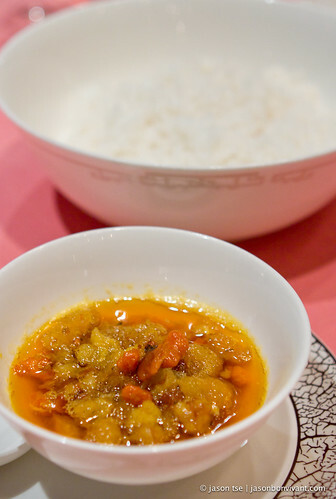 It was the premier crab roe served with steamed rice. Simple it may sound, it was the dish that made all of us to loose our manner. The crab roe and the oil from it more than lighted up our joy alert but also turned our semi-full stomach into an empty stomach hungry for more!!! We wanted more and we were begging the chef to give us more if possible, just more steam rice and a small bowl of the roe would be splendid! Our wish came true and we turned into a few hungry bloggers who haven't eaten for the whole day, fighting over the last drop of those crab roe and crab oil! It was quite an interesting scene which we swore not to talk about it publicly ever again! 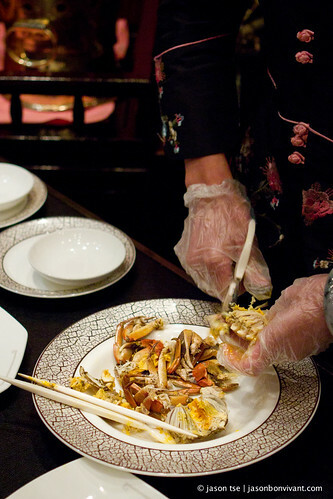 This small bowl of crab row and oil was said to made from more than a dozen of crabs. Talk about indulgence right? 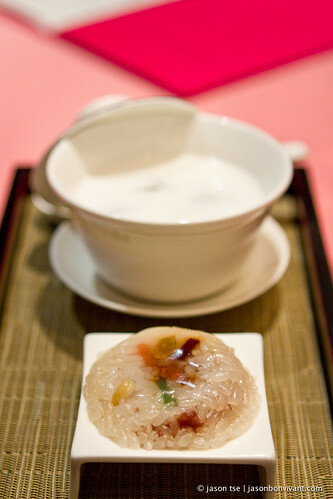 The fresh coconut milk, walnut jelly and eight treasure sticky rice were neatly presented with both desserts made with just the right sweetness. Usually the eighth treasure sticky rice is served pan-fried but I do like the alternative approach which made it unique. 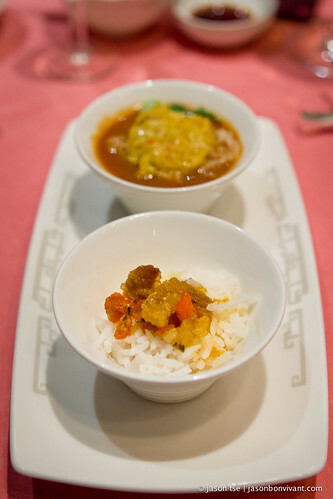 While having the desserts, I was (and I am sure the rest of us were) thinking about the crab roe with steamed rice still! Once again, thanks Man Wah for the lovely invitation to experience the advance tasting for the upcoming Shanghainese hairy crab offering. If you want to kick off the hairy crab season with some indulgences, do make your way to Man Wah starting 15 October 2011! Crab Row with steamed rice! I want more! 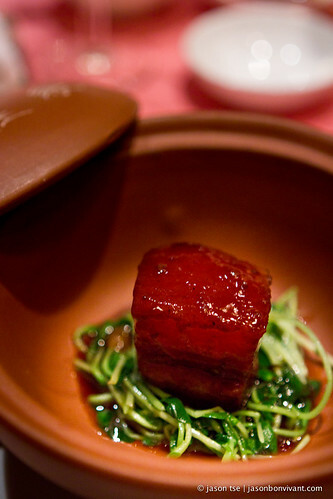 Melt in your mouth Shanghainese Stewed Pork! The sweet and sour fish was slightly too dry for my liking. I still like to de-shell my own crab but it was a heck of a show!! !